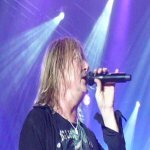 Def Leppard singer Joe Elliott was interviewed by WFTL 640 Sports radio yesterday and the audio is available plus quotes. Joe talked about Down 'n' Outz The Further Adventures Of... album, Rock And Roll Hall Of Fame, Mott The Hoople, the Down 'n' Outz band history, the 2015 studio album, a Pyromania residency and 2015 world tour. Joe talked about the Pyromania Residency once more suggesting it could happen early in 2015 before the band release the next album and go on a world tour. Listen to the full 10 minute interview starting at 30.16 mins into the 43 min podcast via thelink below. "Well we've half had that. When we did VIVA! Hysteria we played Side One of High 'n' Dry and it's on the DVD. In fact you get seven of the ten tracks of High 'n' Dry on that DVD. We are gonna go to Vegas and do VIVA! Pyromania - possibly next year. I don't know that we'd tour or not because we're right in the middle of recording a new album." "So chances are that we'd do the VIVA! Pyromania thing and then do a world tour promoting a new record. But you never say never to anything. I mean life's too short to keep saying no to everything. I mean maybe say no to the Rock And Roll Hall Of Fame but not necessarily touring Pyromania. That might be a good thing to do one day."